So, people when i say it is easy, trust me, it is easy. Now coming to today's recipe, it is really really easy, just a snap of your finger, you can make this. No extra work involved. 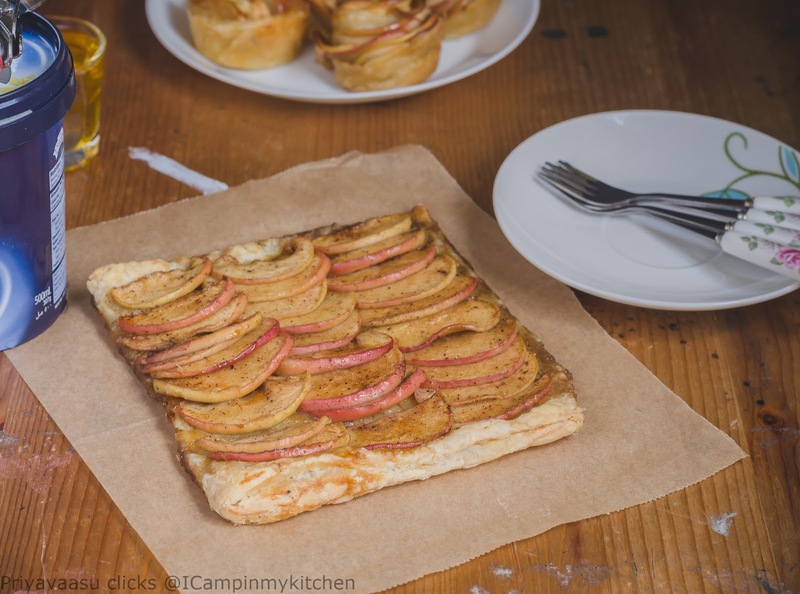 Cut apples, roll sheet, place the apples and bake!! Tada, a beautiful tart ready for your dinner/lunch. 2 tsp of butter for brushing the pastry sheet. Remove the puff pastry sheet from the freezer and thaw it in the refrigerator for an hour or two. Just 30 minutes,before making the pastry remove and keep it on the counter. Wash the apple and cut it into thin slices. Take them in a wide bowl, add brown sugar, lemon juice, cinnamon powder, ginger powder, clove, vanilla extract and mix well. The apple slices must be coated well with the spices. Flour your work surface well, remove the puff pastry to the work-surface and roll it into a square of 6 inches. You can make it how much ever big you want. Place the rolled pastry sheet on a baking sheet lined with parchment. Brush the surface generously with butter. 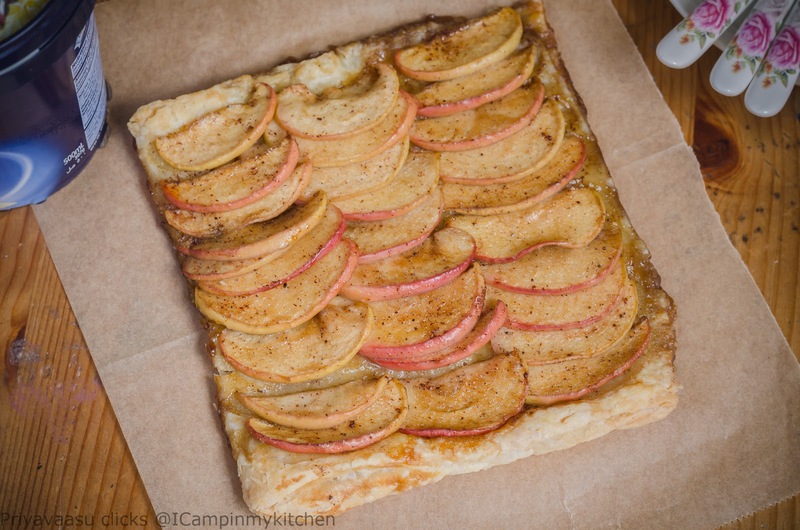 Arrange the spice-coated apples neatly on the pastry sheet, overlapping one another. 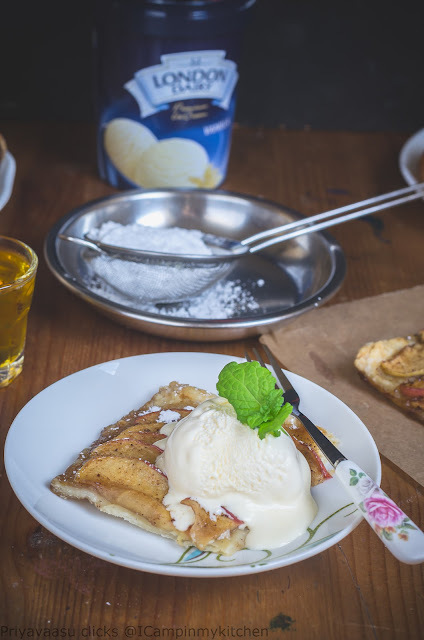 The dessert looks pleasing to the eyes, because of this arrangement of apples, so be patient and arrange properly. Spoon 1 or 2 tsp of juice on top of the apples. Keep the prepared pastry for 10 minutes inside the fridge for 10 minutes. Preheat the Oven to 220C for 10 minutes. Bake the pastry for 30-40 minutes or until the pastry is evenly brown and apples look shriveled. 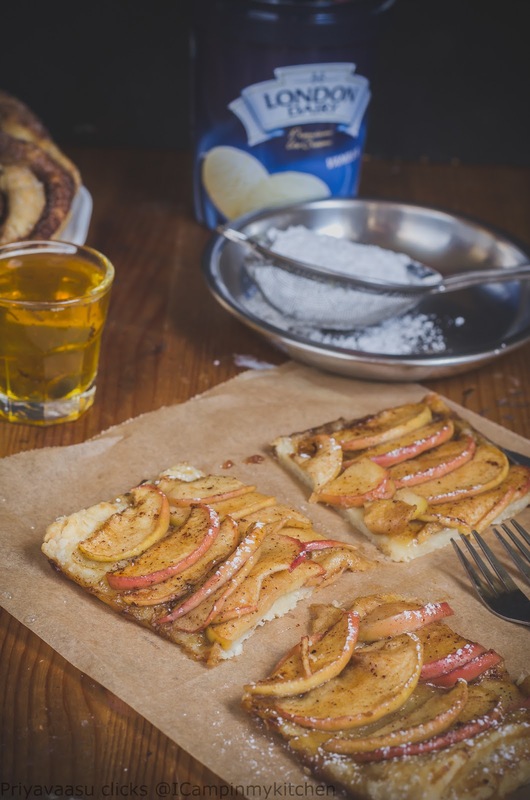 Remove the tart from the oven to a wire-rack. let it cool well. Cut the tart into 4 and serve it warm with a generous scoop of Vanilla Ice-cream. Another delicious bake Priya -- so simple to make yet sooo fancy and elegant to look at. 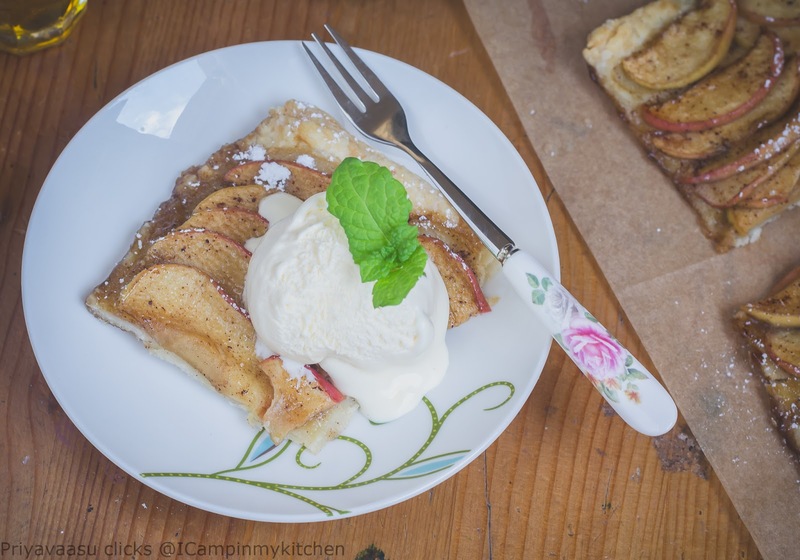 This apple tart is my all time favourite, very tempting tart slices there. Oh Priya, I am with you when it comes to cutting veggies or fruits to even size. I love puff pastry and there are endless ways to use it. 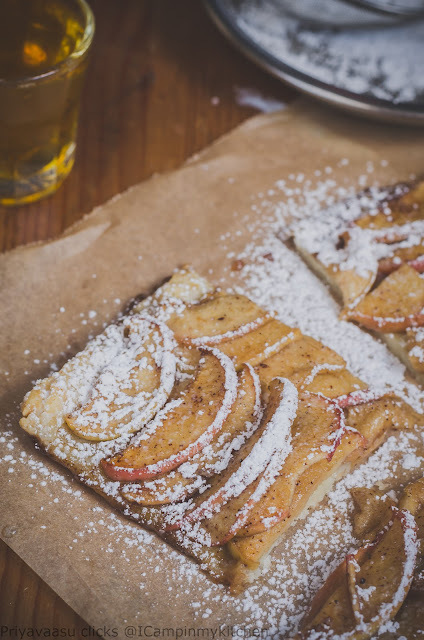 That is a beautiful apple tart. Priya thats one classic bake...the pictures makes me want to grab right off the screen..very nice..